Twisted Steel, original photography by Joe Ercoli. Sometimes you just need a break and during those times (actually, quite frequently) Jen and I make that pilgrimage to our roller coaster mecca, Six Flags Magic Mountain in Valencia, California. If we’re feeling generous, sometimes we even take the kids! We have a theme park nearby, Great America, but unfortunately the size and excitment of those rides just doesn’t compare with Magic Mountain so, with season passes in hand, we make the 6-7 hour trek to SoCal from our home in the SF Bay Area. 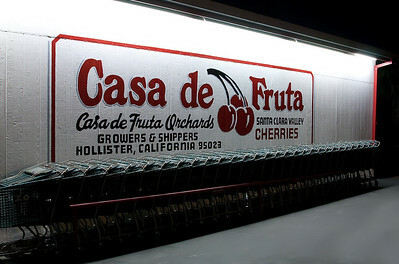 As long as we don’t leave too late for our drive, which usually starts about 7PM after work on Friday nights, Casa de Fruta is a mandatory stop. Located in Hollister along highway 152, it’s usually our first stop leaving the Bay Area unless we grab a bite to eat at In-N-Out in Gilroy. Jen loves their huge selection of fresh and dried fruit, but her sweet tooth always make her grab a few of their awesome caramel apples. I’m usually happy to just get out and stretch my legs a little but one of these days I want to go there during the day and actually walk around the place. As you walk up to the main fruit stand, there is a bunch of old, but freshly painted, farm equipment, tractors and there is a small scale train that runs there, too. Looking through my blog or any of my galleries you’ll notice that most of my work has been in HDR, but on this trip I made an effort to take more exposures that could stand alone and not rely too much on post processing. The pic to the left one exception to that along with the Harris Ranch pic below. 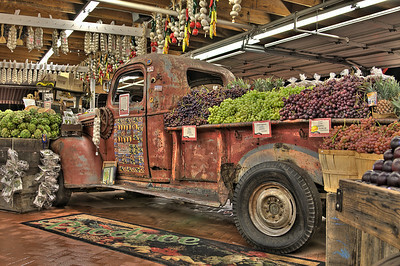 This truck sits in the middle of the fruit stand floor and, as you can see, is covered in product. I shot this HDR handheld with a 24-105mm lens on my Canon 40D. 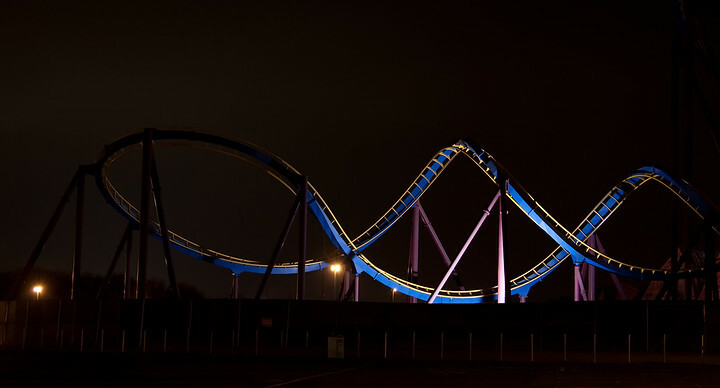 The shot at the top of this post is of a roller coaster at Six Flags called Scream. It looks like Six Flags was expanding a little when they built this floorless coaster and built it right on top of part of the parking lot. You can see the lines for the parking spaces on the asphalt right underneath ride! We got in two days of riding roller coasters on this trip and headed home on Sunday night. 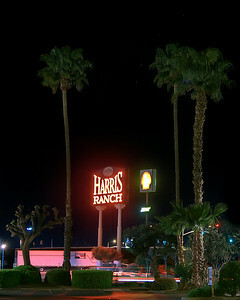 Anyone that has driven I-5 from Socal has seen the sign for Harris Ranch, but have you stopped there? I’m a big beef lover and the cowboy ribeye that I had last weekend rocked! It’s like an oasis on a desolate highway. Look for this sign and turn in! As mentioned above, this pic was processed a bit but is not HDR. I exposure blended 4 different images to the result that I wanted after shooting on a tripod in a pitch black parking lot. There are more pics from this trip on my Smugmug gallery including a panorama of Colossus, the Six Flag’s huge wooden roller coaster that you’ll remember from the movie Vacation when the family broke into Wally World. Next up I’m heading to Arizona for spring training this weekend. More pics to come! This entry was posted on Thursday, March 19th, 2009 at 11:12 am	and is filed under Blog, Photos. You can follow any responses to this entry through the RSS 2.0 feed.